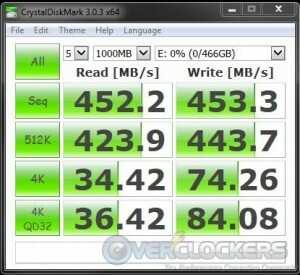 The push is on for motherboard manufacturers to get USB 3.1 capable products to market. ASUS is certainly doing their part as witnessed by their recent refresh to many of their Z97 and X99 motherboards making them USB 3.1 ready. 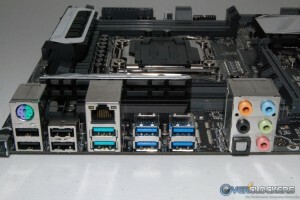 Depending on the motherboard, ASUS will either provide USB 3.1 connectivity built into the motherboard’s rear I/O area or provide a PCI-E expansion card. Additionally, ASUS plans to sell the PCI-E expansion card separately, so people that already own a compatible ASUS motherboard can come along for the ride too. ASUS was kind enough to provide the X99-A/USB 3.1 motherboard and a nifty USB 3.1 storage device for testing purposes. Let’s dive in and see what kind of performance ASUS can squeeze out of this new USB 3.1 technology. 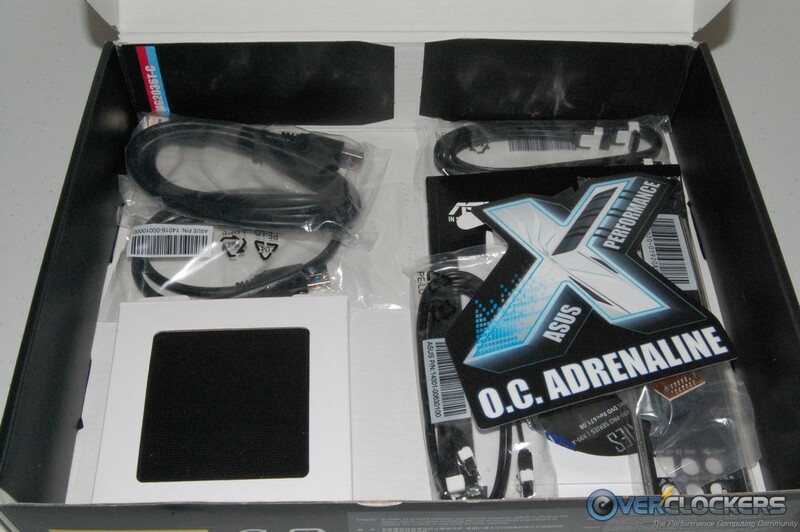 Plans are to initially release a dozen or so USB 3.1 motherboards and a couple different PCI-E expansion cards. Below is the list of motherboards thought to be in the first round of releases. 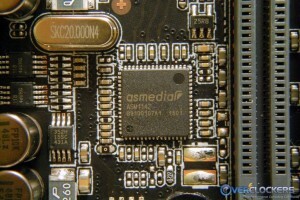 All of the motherboards will utilize the common Type-A connector, whether from the add-on PCI-E card or onboard. Even though a new Type-C connector option makes its debut with USB 3.1, it makes perfect sense to continue using the Type-A connector for backward compatibility with USB 2.0/3.0 devices. As you can see, only the top X99 motherboards in the ROG and Channel series get a bundled PCI-E card, and all the lesser motherboards will have USB 3.1 onboard. 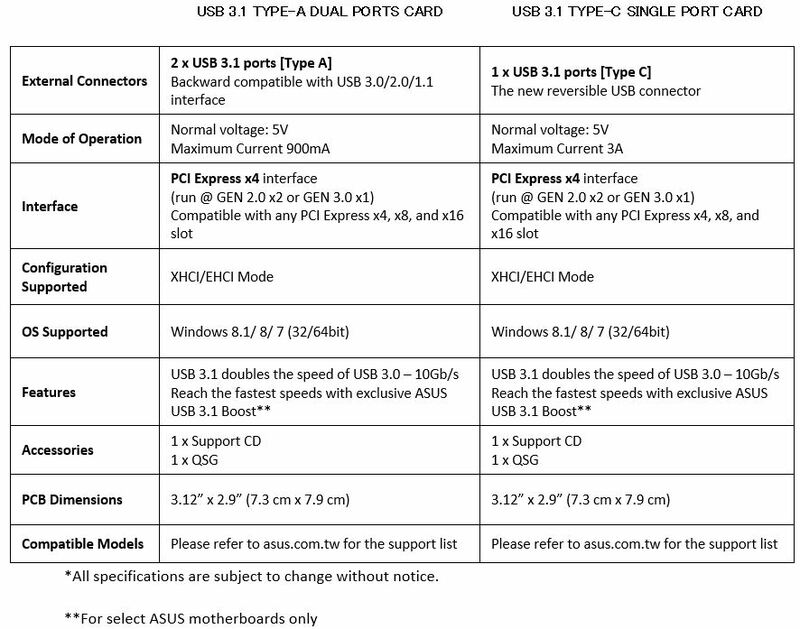 As we mentioned, ASUS also plans to release two USB 3.1 PCI-E expansion cards. 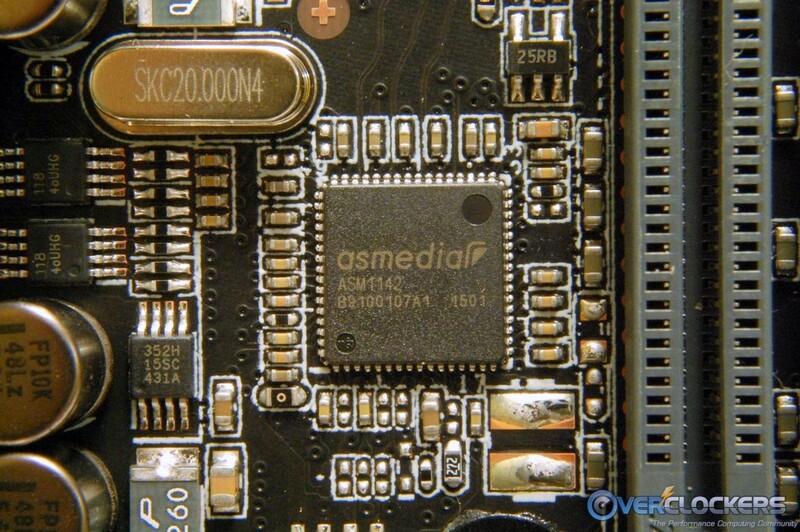 Officially, ASUS only guarantees compatibility with their qualified motherboards, but they should work with other brand motherboards as well. 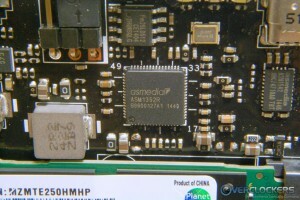 The PCI-E expansion card options include one with two Type-A connectors and one with a single Type-C connector. The picture below lists the officially supported Z97 and X99 series motherboards. 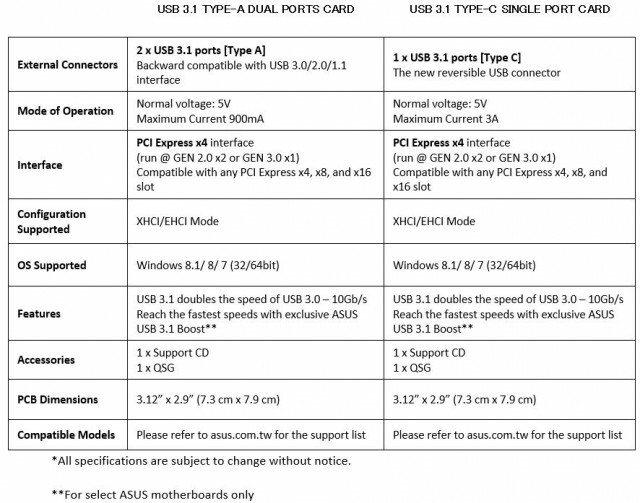 Here are the specifications for each USB 3.1 expansion card. One thing worth noting about the new Type-C connector is that a matching cable has no wrong way of plugging in. Just grab the cable end, and plug it in. There is no top or bottom to concern yourself with. ASUS is putting there own spin on USB 3.1 performance by updating their USB 3.0 Boost utility to what’s now called USB 3.1 Boost, of course. We’ll test this new version out and see if it actually increases transfer speeds. ASUS has made driver improvements as well, which are best explained by the snippet below taken from technical guide we were provided. 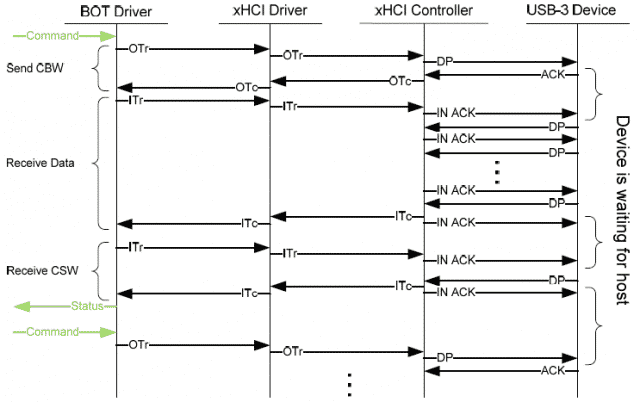 The BOT (Bulk-Only Transfer) USB architecture is commonly used, and as illustrated below, the traditional BOT protocol can only handle one request at a time. The BOT protocol also needs to wait for a device handshake to complete before data transmission or any other transfers can commence. In order to negate the impact of these performance handicaps, the traditional BOT protocol has been optimized by enlarging data packet size and by utilizing a cache on USB 3.1 controllers. However, optimized BOT, still does not have the luxury of command queuing, meaning it will not improve transfer performance when multiple files are transferred at the same time. That being said, the ASUS implementation of Optimized BOT Protocol does deliver a noticeable performance gain in USB 3.1 data read speeds, thanks to the adoption of a streaming architecture, where much of the round trip time between command phases can be saved. The other advantage of having the ASUS Optimized BOT (i.e. the Turbo Mode) is the fact that it supports all USB devices that support SCSI commands rather than being restricted to supporting UASP enabled devices only – making it more accessible for users. 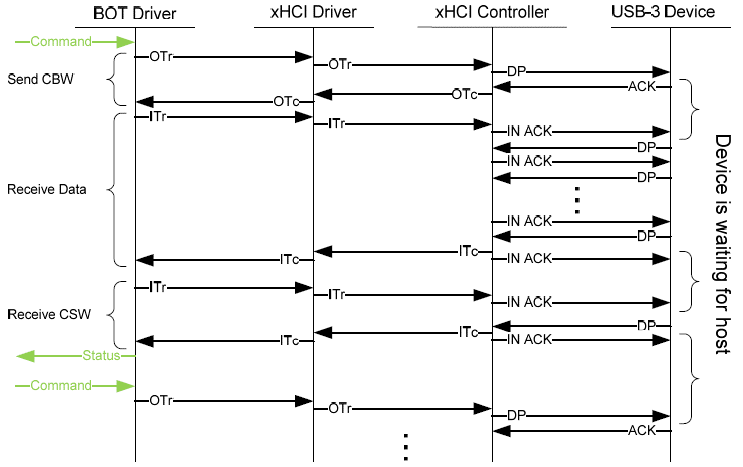 The adoption of the SCSI Protocol in USB 3.1 provides better data throughput than traditional BOT by eliminating most of the round trip delays between command phases and by utilizing a multi-tasking aware architecture that enhances performance further when faced with multiple transfers. Since the inception of USB 2.0 back in 2001, we’ve seem some impressive gains in the technology. 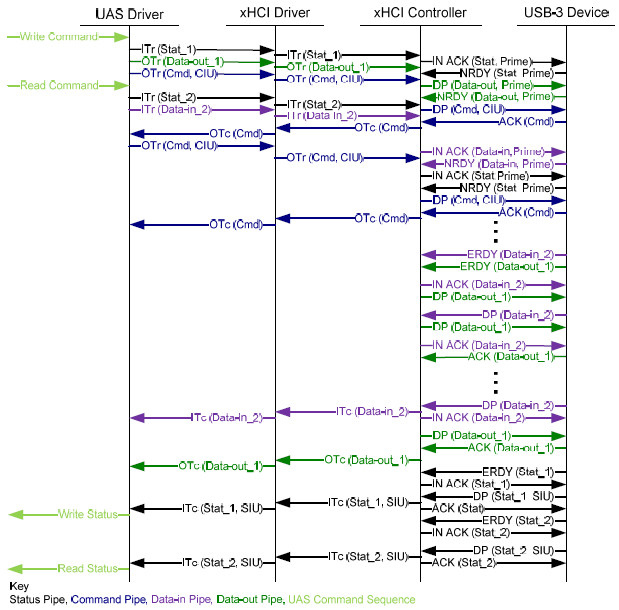 In 2009, USB 3.0 hit the industry and offered 10x higher throughput than USB 2.0. 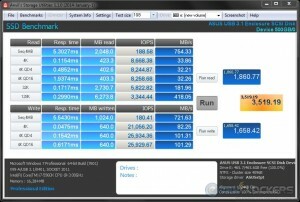 Fast forward to today, and USB 3.1 offers another huge jump in throughput compared to USB 3.0 (4.8 GB/s versus 10 GB/s). 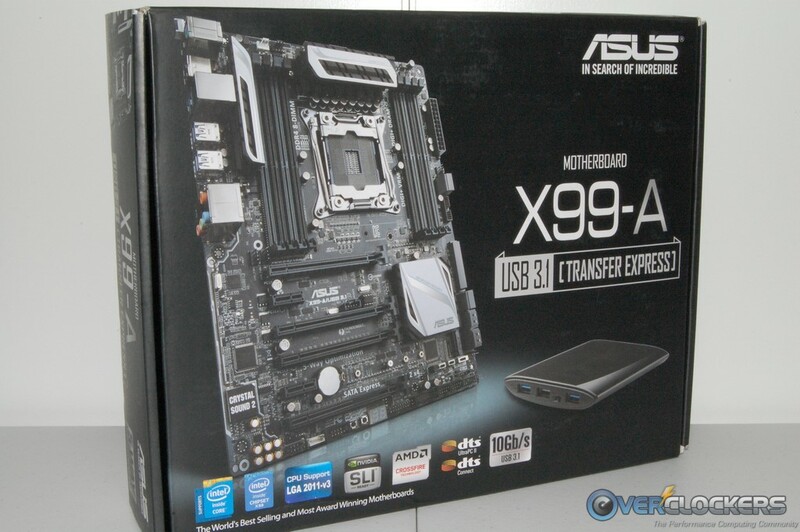 As we mentioned earlier, ASUS provided the X99-A/USB3.1 motherboard as part of the test bundle. 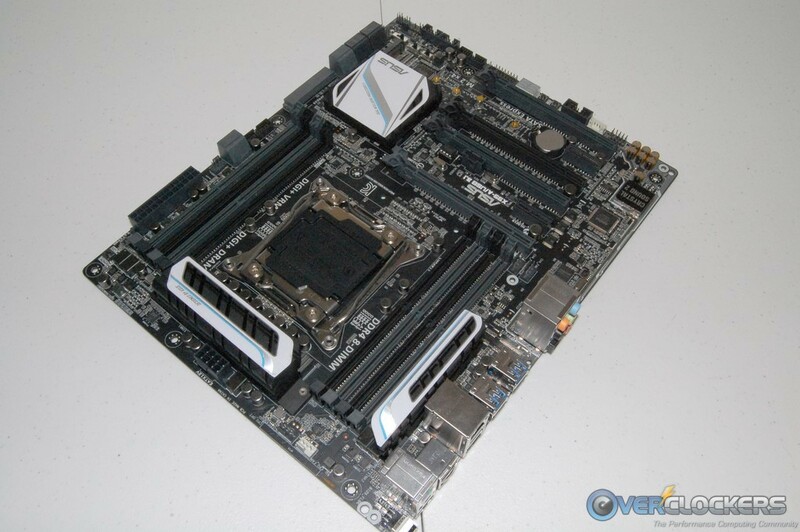 We already reviewed the X99-A a while back, which is identical to this motherboard, except for the onboard USB 3.1. The original X99-A has six USB 3.0 ports at the rear I/O, and the new USB 3.1 version has four USB 3.0 and two USB 3.1 ports. 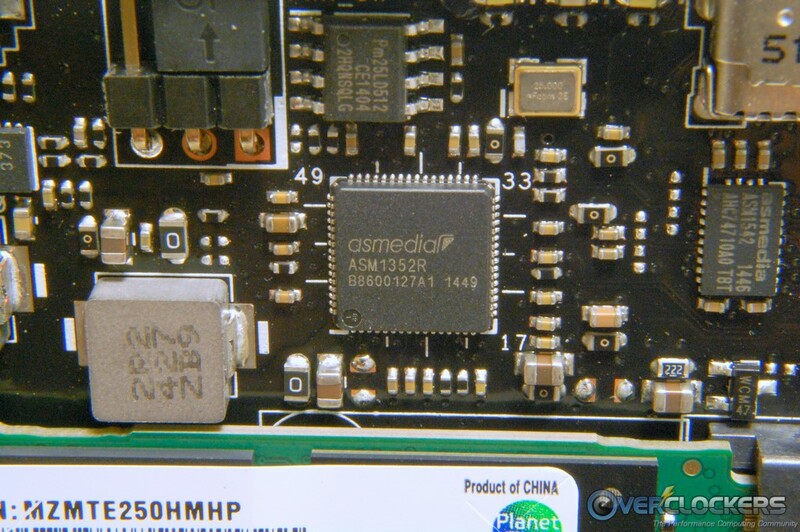 To bring USB 3.1 to the motherboard, the ASMedia ASM1142 controller is used. There are a few things worth mentioning as you look through the pictures below. You might notice the the box top makes mention of “Transfer Express.” That’s actually a new addition to the accessory stack and should also be available as a separate purchase soon. 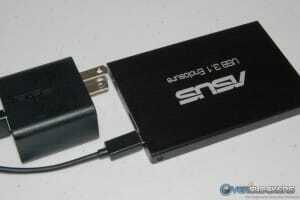 The Transfer Express is a USB 3.0 device that enables one-click PC-to-PC file transfer and synchronization. It can also extend or mirror your monitors between two systems. Other features include the ability to let your Android smartphone use the PC’s mouse and keyboard or send audio to the PC speakers. If you look closely at the rear I/O area, you’ll see the USB 3.1 ports are identifiable by their teal color. I don’t think there is an industry color standard for USB 3.1 ports yet because I’ve seen a few different colors being used, depending on the motherboard maker. For more information on the X99-A/USB3.0, you can visit the ASUS product page. If you’re interested in a full review, please check out our X99-A review (linked to above), and combine that knowledge with the USB 3.1 testing here. That should be everything you need to know about the X99-A/USB3.1. 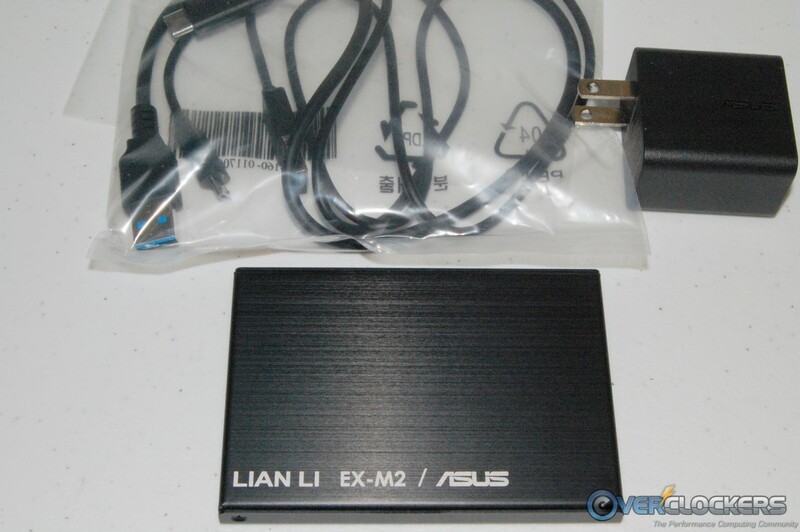 To make sure we had a device capable of measuring the potential of the USB 3.1 interface, ASUS included their USB 3.1 storage device. 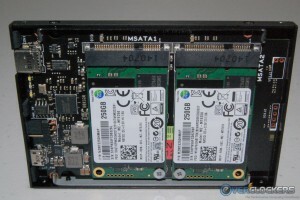 This small form factor device houses a pair of 250 GB Samsung 840 EVO mSATA SSDs in a RAID-0 configuration, which should be plenty of throughput for testing purposes. 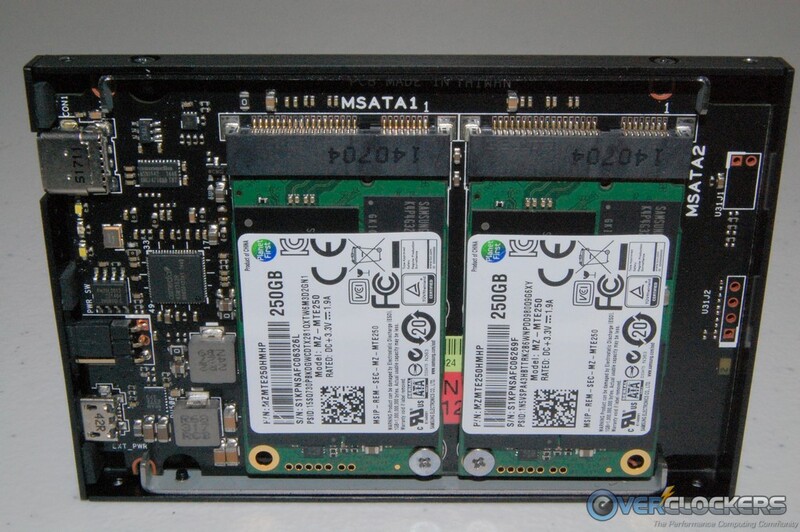 Inside the storage device, we can see the two mSATA SSDs and the ASMedia ASM1352R (USB 3.1 to SATA 6Gbps RAID/Port Multiplier). 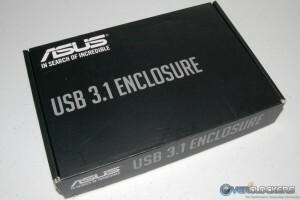 The housing is an ASUS branded Lian Li all-aluminum affair, which is of excellent quality. From the pictures below, you can see the Type-C connector we talked about earlier and that the unit requires auxiliary power through a micro-USB port. 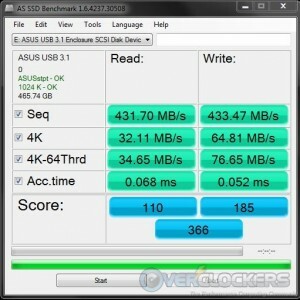 We don’t have any information on whether ASUS will make this storage available for purchase or not. We certainly hope they do because it’s definitely a unique device that has the potential to be a real powerhouse! We’ll fire up the ASUS USB 3.1 Boost utility to obtain maximum results, and then use CrystalDiskMark, AS SSD, ATTO, and Anvil’s Storage Utility to check performance. To give you an idea of the performance increase USB 3.1 offers, we’ll also test the ASUS storage device using an Intel USB 3.0 port. 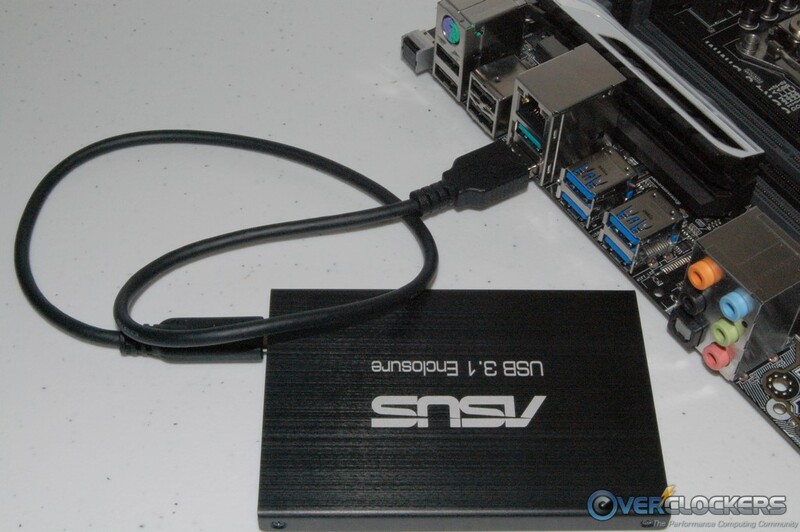 ASUS informed us the only way to Secure Erase the storage device is to remove both mSATA SSDs from the device, plug them into a mSATA port on a motherboard, and do them one at a time. Obviously, that would take an enormous amount of time to perform after each benchmark run, so we’ll use Windows Disk Management to delete the partition and then do a quick format before each test. 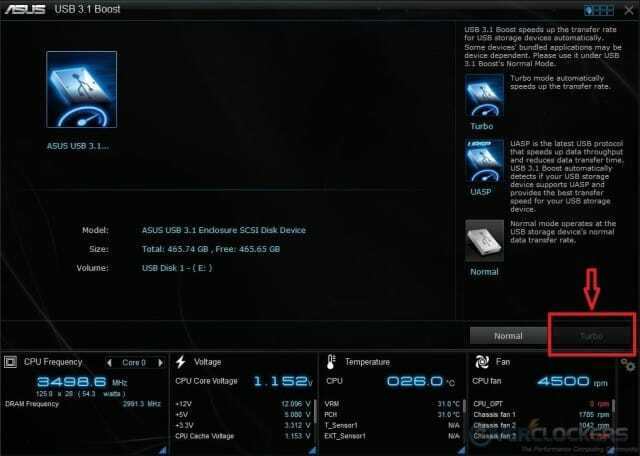 If you’re using Windows 7 like all our test systems do, then you definitely want to install USB 3.1 Boost to get the maximum possible performance. USB 3.1 Boost is part of the AI Suite 3 software bundle included with the motherboard. If you prefer not to install the entire AI Suite 3 package, you can opt to install just USB 3.1 Boost during the install process. Once that is installed and the utility is open, just click the Turbo button, and you’re good to go. Once you’re all set, you can close AI Suite 3 and even tell it not to start with windows. The settings will still stay resident on the system until you manually turn them off. 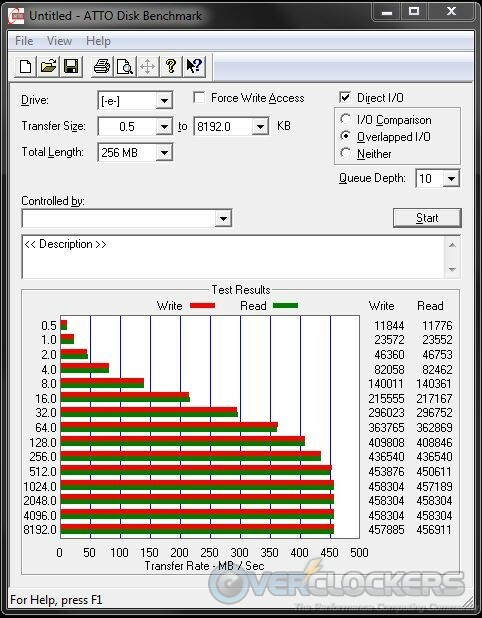 Windows 8/8.1 users already have UASP built into the OS, but you should still see some improvement in throughput by using USB 3.1 Boost. It won’t have as dramatic an effect as it does when using Windows 7, but it’s still worth using. 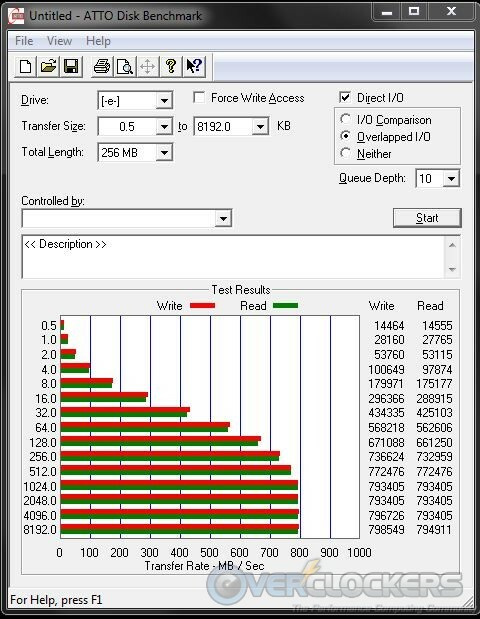 Looking at the benchmark results above, it’s obvious USB 3.1 has the capability of throwing out impressive throughput numbers. 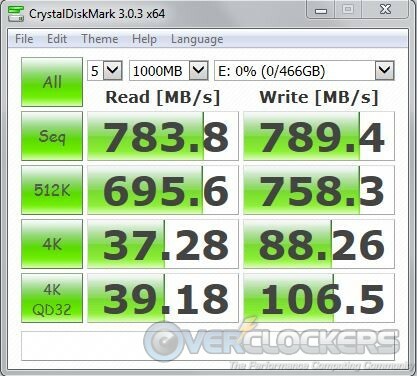 Just as impressive is the performance increase from USB 3.0 to USB 3.1. It’s going to be interesting to see what kind of USB 3.1 devices all the different manufacturers come up with to support this new interface, and hopefully, it won’t take an excruciatingly long time to happen. Looking at the hardware ASUS provided for the testing, we’re hoping ASUS decides to offer the storage device through retail channels. 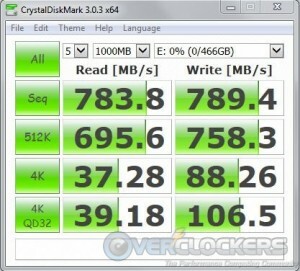 It’s a great performing device, even if you’re currently limited to USB 3.0 on your system. 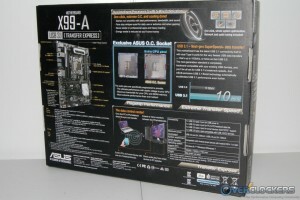 The X99-A/USB3.1 carries a MSRP of $279 according to ASUS, which is about $45 more than the original X99-A. That’s a fair price increase considering the addition of USB 3.1. 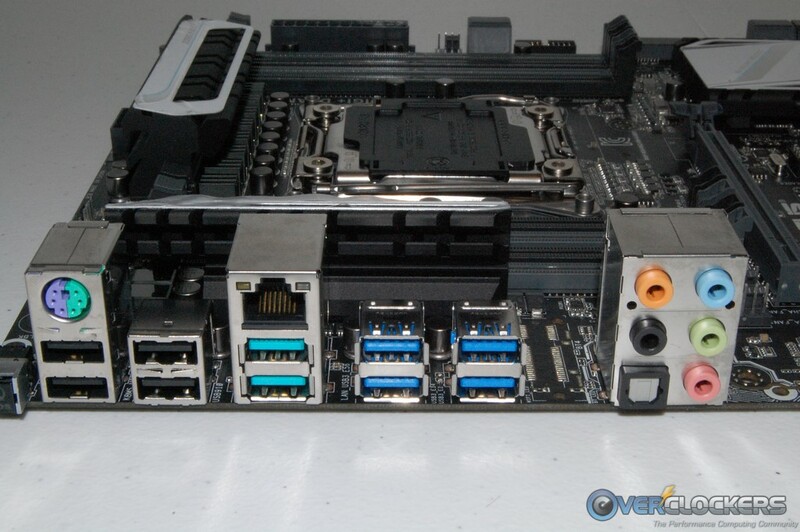 The official release date for the X99-A/USB 3.1 was 3/10/2015, so we expect it to hit store shelves any time now. 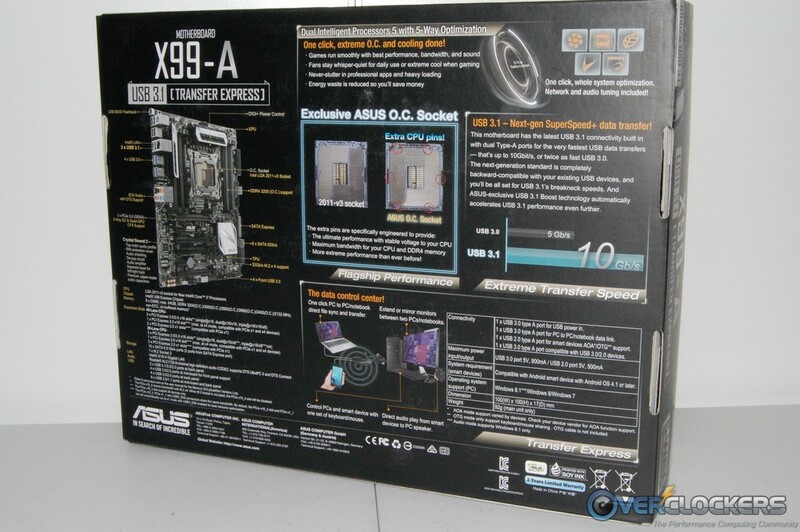 It’s definitely a worthy contender if you’re looking for a lower priced X99 motherboard with onboard USB 3.1. This article isn’t about handing out awards, but we’re extremely impressed with what USB 3.1 is capable of and equally impressed with what ASUS is doing to bring it to consumers. 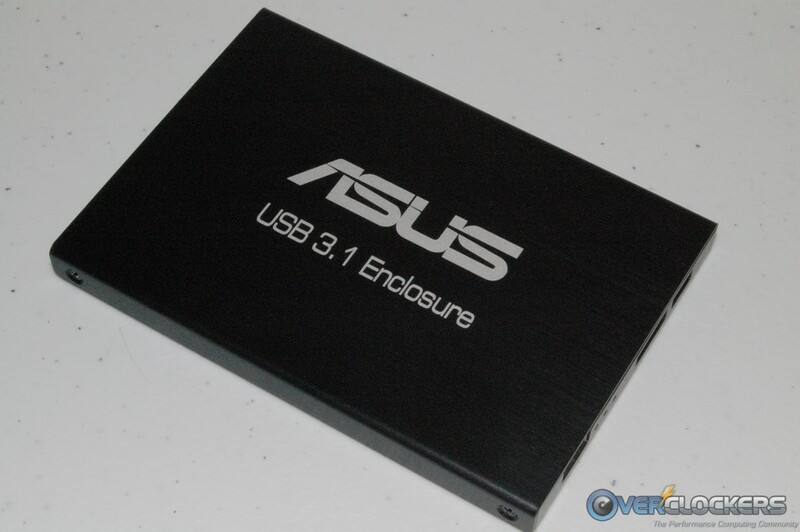 Once USB 3.1 devices hit the market, ASUS will have a lot of options to make the most of it.